With accelerating improvement in vacancy from 9.2% to 7.8% year-over-year, Tucson’s industrial market reported the strongest annual gain since 2006 and the lowest vacancy mark since Q3 2008. With occupancy above 92% and no speculative space under construction, the market will experience upward movement in rents. Rent pressure has already occurred for spaces 5,000 square feet (SF) and under. 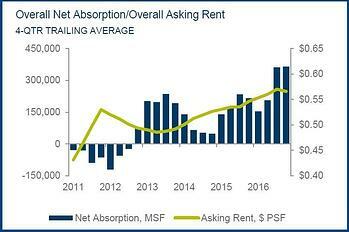 Net absorption for 2016 nearly doubled that recorded in 2015 at nearly 1.5 million square feet (MSF). Absorption over the past twelve months exceeded all years since 2006’s high of 1.9 MSF. Heightened leasing activity in the fourth quarter was a result of local companies expanding, as well as a return of construction suppliers and Phoenix firms opening southern Arizona branches. The largest lease signing of the year was Chamberlain Group’s 300,181-SF lease with EastGroup Properties for a new build-to-suit at 2850 E Drexel. Construction is expected to begin early second quarter 2017 with occupancy by year-end. Sales market velocity escalated in the closing months of 2016, with 15 sales signed during fourth quarter, the majority of which were purchased by end users. Key investment sales in 2016 included Clairemont Plaza, 4700 S Overland, and 3265 E Universal Way, with an average price per SF of $104.09. Projects under construction included three build-to-suits: Worldview’s 150,000-SF facility, and approximate 20,000-SF buildings for Old Dominion and Switchgear Solutions. The unemployment rate in Arizona improved a full percentage point in 2016, with education and health services the strongest sectors. Specific to Tucson, job growth was accelerating, with 5,300 net new jobs in 2016, and a projected 7,100 in 2017, and 7,600 in 2018, according to Eller’s George Hammond. The U. S. economy’s growth rate positively impacted Arizona, as increased mobility is expected to translate to population growth. Statewide housing prices rose 6.7% in 2016, exceeding the national growth rate of 6.1%. Bankruptcies were down 10.5% over the previous year, another positive sign, and consumer sentiment held at cyclical highs. In the year ahead, fewer lease concessions are expected and more rent increases throughout the Tucson industrial market. Next year should also bring heightened leasing activity for large buildings (over 100,000 SF). As Tucson’s largest private employer, Raytheon’s well-publicized hiring announcements spell good news for the region. Growth in the e-commerce sector will continue to benefit warehouse and logistics space, and job growth in the region will fuel further demand for commercial real estate. While the change in administration spells optimism from the business sector from a regulatory and tax standpoint, southern Arizona is directly impacted by shifts in trade policies.